Kate and Peter exchanged vows last fall at Hotel Emma. Taking cues from the industrial design and deep earthy tones of the surroundings, we chose flowers in shades of deep red, merlot and terra cotta. Boutonnieres consisted of deep burgundy ranunculus, heuchera leaves and pernettya berries while peonies, garden roses and dahlias popped off of steel gray sequined bridesmaid dresses. Coming all the way from France, the groom's niece shined as flower girl—look at that smile!! The beautiful invitation suite by The Girl General. At the reception, guest tables were filled with lush floral arrangements and candles along with tall vases of magnolia branches. 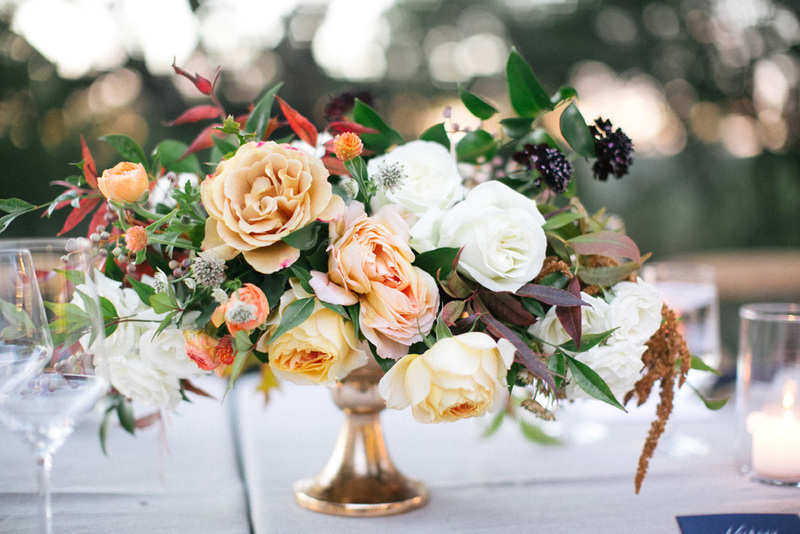 The beautiful images are compliments of May Carlson and the many details were handled masterfully by Katherine Lopez and her team from Sweet August Events. More images can be seen over on Carats and Cake. And lastly, best wishes to the happy couple—congrats Kate and Peter! The landmark Pearl Brewhouse in downtown San Antonio has been masterfully transformed into Hotel Emma—a boutique hotel combining original and historic materials with modern amenities resulting in a luxurious experience like no other. Collaborating with Melanie of Mayhar Design, we chose to juxtapose the industrial chic decor with luxurious details—lush blooms, velvety textures, graphic letterpress and high fashion—all beautifully captured by Kayla Barker. More of this shoot can be seen here as featured by Style Me Pretty. Ashley and Aaron were married in April in a gorgeous setting at Boot Ranch near Fredericksburg. Melanie of Mayhar Design pulled together the details seamlessly whie Feather and Twine captured the beauty of the day. Set on the 10th hole, the chuppah was covered with roses and greenery providing a lush backdrop to the ceremony with a beautiful view of the nearby waterfall. Ashley wanted her bouquet to be full of color so we packed it with Romantic Antike garden roses and Coral Charm peonies along with coral tulips and ranunculus. Katie of Kiss by Katie did a fabulous job with Ashley's hair and makeup. And the bridal party carried paler shades to coordinate with the flowers in the chuppah. Aaron and the groomsmen wore boutonnieres of peach ranunculus and berries. 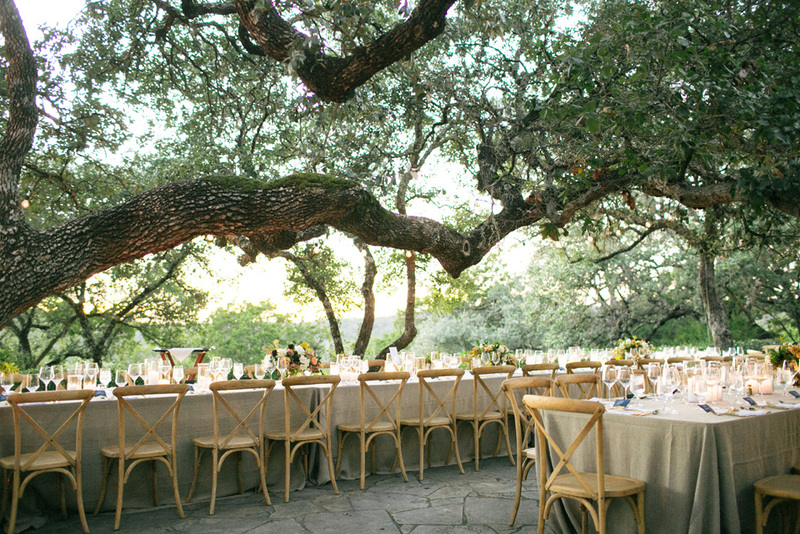 Guests were treated to cocktails at outdoor tables with beautiful views of the Texas Hill Country. Indoors, organic greenery covered the mantles as well as the ceiling above the dance floor with colorful floral arrangements for the tables. More of Ashley and Aaron's story can be seen on Southern Weddings and a big congratulations to these two!! For Janie and Christian's spring wedding, the playful colors of the invitation suite served as the basis for our design and color palette. For Janie's bouquet, we used white and peach peonies along with lush garden roses in the creamiest of peaches with trailing pink jasmine and silk ribbons by Silk and Willow. The bridesmaids' bouquets popped off of their blush dresses with Romantic Antike garden roses and salmon colored ranunculus. This has to be one of my favorite cakes ever—the colorful ranunculus and garden roses were the perfect addition to the cake by Sophie's Bakery with iridescent pearl icing. More of this colorful wedding can be seen here on Grey Likes Weddings.